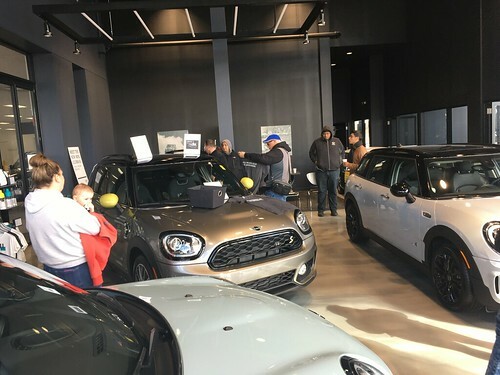 The Chicago MINI Motoring Club is now over 100 members strong!!! I want to thank everyone who has joined, and I hope we are doing a good job keeping everyone happy with the events we have been doing. Calling out to all CMMC baseball fans! We've just received word that we can reserve a block of seats to see the champion Marlins play the Milwaukee Brewers on Sunday, August 15th. Now we need to know how big a block of seats to reserve! E-mail us immediately at so that we can estimate how many people are interested in coming along. This should be a huge MINI meet, with participation from not only the Chicago club, but Milwaukee and Madison MINI motorers as well! So talk it over quickly with your family and friends and let us know before this Thursday, 3/25, how many seats you'd like to take for this event, and e-mail us at ron@chicagominiclub.com ASAP! Thanks to Ron and everyone else who helped put this event together. Also thanks to everyone for coming out – what a great turnout! As is a budding spring drive tradition we had some nice snow showers and an unseasonably cold day. But despite this it seems as if everyone had a great time and learned a little bit about Chicago, MINIs, and poker! If anyone has any photos they'd like to share either post the ULRs in the comments section or send them in via email (our email is in the lower right of this page) and will try to put together a photo-page later in the week.